LNP is the process that allows a subscriber to keep their telephone number when they change service provider in their same geographic area. Local number portability requires that carriers release their control of one of their assigned telephone numbers so customers can transfer to a competitive provider without having to change their telephone number. LNP also involves providing access to databases of telephone numbers to competing companies that allow them to determine the destination of telephone calls delivered to a local service area. This figure shows an example of the typical operation of local number portability (LNP). 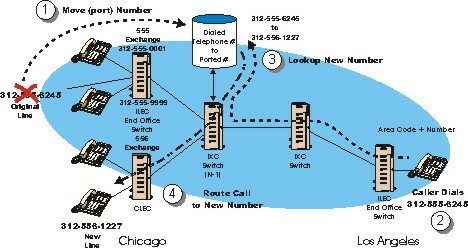 In this diagram, a caller in Los Angeles is calling someone in Chicago who has kept (ported) their old phone number when they connected their service to a competitive local exchange carrier (CLEC). This required the incumbent local exchange carrier (ILEC) to move (port) the telephone number to a LNP database. The line connected to the customer from the CLEC actually has a new telephone number (which the customer is not likely to be aware of). The LNP database associates the new number with the old number. This example shows how the call can be routed from an LEC in Los Angeles to the new telephone line in Chicago using the old telephone number. The call is routed from Los Angeles, through a long distance provider (IXC) who knows by the dialed area code that it needs to connect the call into a local telephone company in Chicago. Because there are several local telephone service providers in Chicago, the IXC must look first into a LNP database to see if the number has been ported to a different service provider. This LNP database (ported telephone number list) must be available to the next to last switch (called "N-1") before the call reaches the end office switch. This LNP database search instructs the last switch to the actual number used for the final connection. The call is then routed to the correct local switching office (new line) so the call can be completed.